David grew up in the Midwest and started playing piano and singing at the age of 4. At 14 he picked up the guitar and has never put it down. Hitching his way from Iowa to California, he landed a full scholarship to a school of performing arts in San Diego California. Performing as a singer and an actor at the Old Globe Theatre, auditioning and landing commercial television spots, David move to the Los Angeles area. In 1977 & 1978 David sang backup vocals both live and on recordings of The Carpenters “Christmas Portrait “ album and also “Sweet Sweet Smile”. Returning to the Midwest for family reasons, David was quickly one of the top studio singers throughout the country, singing on many national jingles recorded in Los Angels, New York, Minneapolis and Chicago. Moving to Perth Australia in 1987 with his wife and two daughters, David sang with an Acappella group called Naughty Fish. One memorable gig was singing at a party for Alan Bond, the Australian hero who was defending the America's Cup, he won in 1983. Since 1988 David has lived in Clearwater Florida raising his two daughters, performing on the beach, and watching his girls dance in the sand, while writing his songs and dreaming of recording his original music, something he has put on hold his entire life. David’s finished his first album “Flavours of Life” in 2007 with 10 original songs and 2 tribute songs. Track 11 “I Don’t Hafta Worry About It”, was chosen and performed for a new Jim Carrey movie that will come out in 2009. He just finished an entire album titled “Dedicated”, a tribute of truly great songs that were sung by Karen Carpenter. “Dedicated” is an album that all Carpenters’ fans will surely appreciate. David is currently in the studio working on his 3rd album of all originals. RadioIndy is pleased to announced that we have published our CD Review of David Cahalan music to CD Baby. FANS - Please checkout David Cahalan online! Radioindy has published David Cahalan CD Review to Payplay.com. FANS - Please checkout David Cahalan Payplay page and play / purchase some great new music! RadioIndy created a CD Announcement Press Release for David Cahalan on Digg.com! Radioindy is pleased to announce that we have published our CD Review for David Cahalan to YouTube.com. FANS - Please checkout David Cahalan iTunes page play / purchase some great new music! RadioIndy is pleased to announced that we have published our CD Review of David Cahalan music to Facebook. FANS - Please checkout David Cahalan page and sample / purchase some great new music! RadioIndy is pleased to present David Cahalan with a GrIndie Award for the CD "Dedicated"
With the fittingly titled “Dedicated,” David Cahalan pays tribute to the music of The Carpenters, for whom he is a former background singer. He modernizes each tune with his melodic, individual style, breathing new life into the original while making it his own. He opens the set with the familiar “Hurting Each Other,” updating the standard tune with his modern style of pop. He gives the classic “Close To You” a contemporary flair with a bright, bouncing groove, and smooth lead and background vocals. His version of “For All We Know” is a touching ballad, featuring soulful vocals by Cahalan and a shimmering soprano sax melody. His rendition of “Superstar” features a great horn section and a brilliant string arrangement. “Bless the Beasts and the Children” is a wonderful duet, with Cahalan and his female counterpart in fine form. 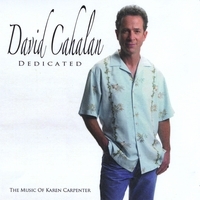 With “Dedicated,” David Cahalan pays a suitable and proper tribute to truly great songs that were sung by Karen Carpenter. This is surely an album that all Carpenters’ fans will appreciate.